Convenient and quick removal of texta, marker, feltpen and spay paint from play equipment, signs and painted surfaces. Graffiti EzyWipes - A durable and strong pre-moistened towelettes impregnated with a pleasant smelling citrus chemical to ”wipe-on and wipe-off“ graffiti from signs, painted surfaces, playground equipment and colour bond. 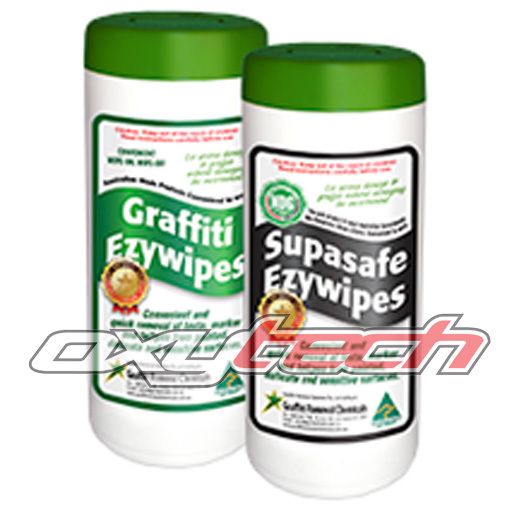 Safe and easy to use, Graffiti EzyWipes hold more active cleaning agent than any other graffiti wipe on the market. Ideal for Open Space and Road Crews, Traders Groups and Volunteers.